Munchkin has been incredibly picky about what she will eat lately. At 18 months, I am hoping she will grow out of this soon. But, I imagine it is the standard for kids. I try to find something healthy that she likes and I have to say I hit the jackpot with peas. It actually started when I made the Cheesy Farfalle with Turkey and Peas she picked the peas out of the dish and just ate them. I thought it was funny at the time, but it occurred to me today as I was getting ready to make her a peanut butter and jelly sandwich for dinner yet again, that I could make her a dish with peas. One that we could all enjoy (okay, who am I kidding? Chad will NOT eat the peas. But, Munchkin and I would love them.) with dinner. 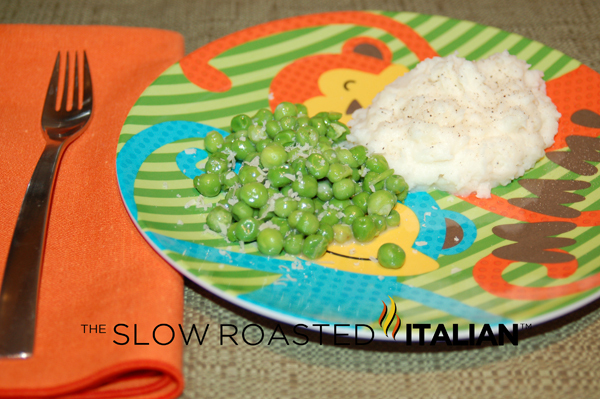 I prepared these incredible Parmesan Peas tonight and served them with a fluffy Buttermilk Mashed Potato side. The peas are cooked for only 2 minutes, just until firm. They still have a little snap when you bite into them. The sauce is smooth, buttery and cheesy, so creamy it melts in your mouth. With a nutty flavor from the Parmesan, and a hint of lemon pepper these are incredible!!! Munchkin was so excited to have her peas and potatoes served on her brand new monkey plate, but she seemed more excited to eat the peas. It was so funny, my prim and proper little girl that must eat everything with a fork lately (including PB&J) got frustrated that she could not 'poke' the peas fast enough and starting picking them up by hand. Every bite was followed with a sound that is like music to Mommy's ears "Mmmmmmm". It fills me up completely to watch my family enjoy these dishes I prepare for them. Adapted from Ezra Pound Cake and Jamie Oliver. Reserve 1 cup of the cooking liquid. Drain the peas, place them back in the pan with about 1/4 cup of the reserved liquid. Return pot to the warm stove top with the heat off. Add a tablespoon of butter. Stir until butter is dissolved and combined with the cooking liquid. 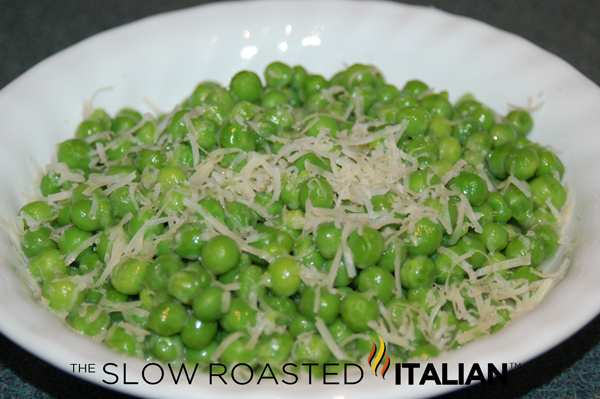 Sprinkle in Parmesan, and stir again until every pea is coated in the cheese. (You may need to add a bit more reserved liquid to loosen up the sauce and the peas.) Add 1 - 2 tablespoons of lemon juice and a sprinkle of pepper. Garnish with reserved Parmesan cheese and serve immediately. simple and delicious. Peas used to me my worst enemy and now I can;t get enough of them. I put them in everything. Love the parmesan on these! This looks delicious, Donna. That plate is adorable too. This is a plate of goodness. I love peas and add in some parm and I am in veggie heaven! Oh, that's a great way to serve peas. They look delicious and I'll have to try it! Hey, this would make me eat peas too! What a great way to serve them.